Creation Gardens is ready to move forward with a planned facility on the corner of East Market and Shelby Streets in Nulu. We first learned of the project last September, but Creation Gardens owner Ron Turnier now says the company will close on the East Market Street property next week and the new store could be open early next year. Currently located on Main and Hancock Streets, Creation Gardens has struggled with a deteriorating facility but couldn’t put money into the building because it is slated for demolition for an expanded Spaghetti Junction. Now, a settlement has been reached with the Ohio River Bridges Project that allows the new East Market warehouse to be built. Turnier says the new Creation Gardens will be state-of-the-art and offer services to chefs and retail customers. New products including meat, seafood, wines, and breads will be offered in addition to Creation Gardens’ traditional focus on local and regional food. 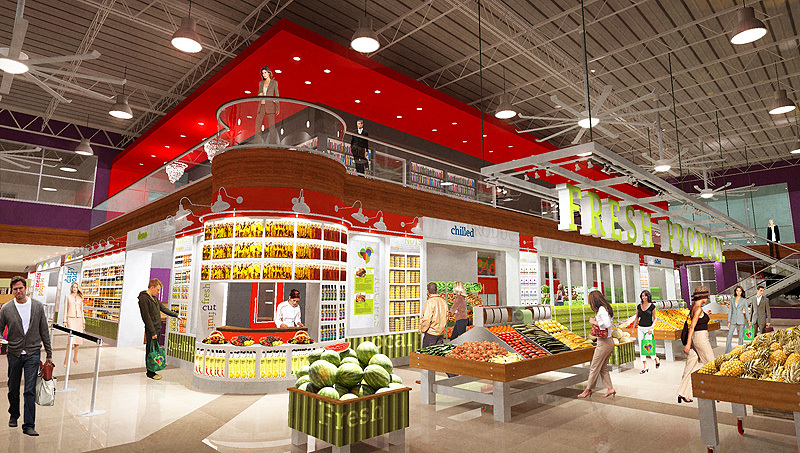 Plans still call for a 27,000 square foot facility that could attract 200 chefs a week and 10,000 square feet of that space will be dedicated to the retail market. Design of the new facility was done by K. Norman Berry Architects of Louisville. Demo Kitchen that will allow you to promote your restaurant, educate customers and perform menu research. Library and Resource area for menu planning and research—complete with cook books, the latest trade publications, and internet access. Located in balcony section. Public Conference Room where you can host meetings or educational sessions. Chefs Special Entrance that gives you quick access to our purchasers, customer service reps and pick-up dock. We Will Host Regular Meetings to allow chefs from all of our regions to exchange ideas and become more successful restaurateurs. One other question…is NuLu the new name for the Phoenix Hill Neighborhood? The old building was really interesting before a fire took down the top floors. Now it just seems a little mangled. Check out the photo on this article about the recently published Louisville’s Butchertown book for a view of the structure as it was originally designed. The deterioration is mainly in the form of a leaking roof (again, a side effect of the fire). There may be other issues, but that’s what I have heard. As I view it, Nulu is the name of the area around the East Market Street corridor. Phoenix Hill is the area south and east of that. 65’s expansion will be terrible to that immediate area. As if it wasn’t a knife enough through downtown Louisville and points immediately south, a widening will only further the destruction and division. This is well-understood on BS, however it is hard for me personally to get excited about this “news” or “progress” when it would appear that a “settlement with ORBP” allowed some or all of it to happen. And, regardless of what goes down, I think it’s highly unlikely any sort of Peugeot (as in the rendering) will ever be cruising down Market! We are situated on the Ohio, not the Loire. Will the store still be open to the general public? How about some push to the west now? And will this business be able to serve the day to day grocery needs of residents in that area, as well? Milk, bread, etc? Yes, the store will be open to the public and have many produce, gourmet and restaurant staple items in stock…including milk, bread, etc. As the Director of the Phoenix Hill Neighborhood Association, I can clarify the question about Phoenix Hill and NuLu. The new “NuLu” District is the East Market District area (Jefferson to Main, Hancock to Baxter, approximately). This area has been and always will be a part of the Phoenix Hill Neighborhood; it is a district within the neighborhood. The Phoenix Hill neighborhood boundaries are Main St. (north), Broadway (south), Baxter Ave (east) and Preston St. (west). PLEASE NOTE: The current retail store will NOT BE CLOSING before the new store opens.